Indonesia’s new president has attempted to launch a bold new foreign policy doctrine. Despite coming into the Indonesian presidency as a man with minimal foreign policy experience, Indonesian president Joko “Jokowi” Widodo has attempted to launch a bold new foreign policy doctrine. Since the end of the Suharto dictatorship, Indonesian presidents have slowly rebuilt the country’s clout in regional and international affairs, which diminished greatly in the chaotic post-Suharto era. Former president Susilo Bambang Yudhoyono, though considered mostly a failure as a domestic reformer, did restore Indonesian leadership of ASEAN and play a significant role in helping mediate several regional conflicts. Still, no president since Suharto proclaimed so bold a foreign policy doctrine as the former Jakarta mayor just did at the East Asia Summit. The Jokowi doctrine, focused on Indonesia’s maritime trade, infrastructure, and security, announces an intention to vastly expand Indonesia’s maritime power. Whether the country has the resources and the political will to put Jokowi’s grand vision into action remains a serious question. The Jakarta Post has published excellent overview of Jokowi’s maritime doctrine. Jokowi and his advisors developed the doctrine during his presidential campaign and the new president outlined the doctrine in his speech at the East Asia Summit in Myanmar earlier this month. 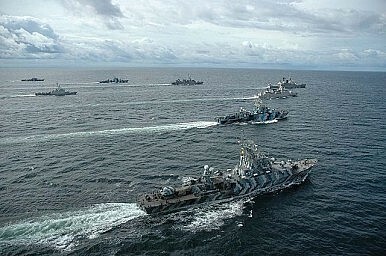 The doctrine posits that Indonesia is a maritime “fulcrum” between Indian Ocean powers (namely, India) and Pacific powers like China and the United States. It also proposes that both oceans should be areas of peace and free trade, and that Indonesia will help protect the natural resources of the seas. The Jokowi doctrine also commits Indonesia to vastly expanding its naval assets, supposedly in order to secure freedom of navigation and trade on these seas. In theory, the Jokowi doctrine sounds practical, wise, and a welcome look toward foreign policy for a leader expected to focus on the country’s huge domestic challenges. But the doctrine faces significant obstacles in practice. For one, Indonesia’s increased military spending will only add fuel to the growing regional arms race, and could make China – suspicious of whether Jakarta is expanding its maritime powers in order to more effectively rebut Chinese claims to areas of the South China Sea around the Riau islands. The Riau area has becoming an increasing flashpoint between Jakarta and Beijing. Though other countries in the region will be less worried about growing Indonesian maritime power than China, Malaysia and Singapore still will demand significant transparency in how Indonesia plans to rapidly expand its naval forces, transparency that the Indonesian armed forces are not known for. In addition, drawing down further resources from the army, especially when that draw-down is being led by someone who lacks any military background, could provoke the army’s officers. Army officers in Indonesia today are far less powerful than they once were but retain sizable networks of power and influence. Third, Jokowi’s plans to upgrade Indonesia’s ports and other maritime infrastructure will rest on whether he can attract larger pools of foreign investment than his predecessors did. Indonesia does not have the domestic resources to make the level of infrastructure improvements Jokowi intends to make. Attracting significant investment in Indonesian ports will be hard. Japanese investors have made commitments to help upgrade Indonesia’s maritime infrastructure, but Jokowi’s plans to woo European, U.S., Singaporean, and Australian investors look shakier. The fact that Indonesia’s main ministries dealing with maritime issues are run by people with minimal maritime experience or, in the case of the defense ministry, a powerful nationalist with alleged links to human rights abuses, is hardly enticing to most foreign investors. Is Jokowi Turning His Back on ASEAN?Indonesia Keen On ‘Big Brother’ Role in ASEAN and Beyond: Official Is Indonesia Turning Away From ASEAN Under Jokowi? Yudhoyono’s Checkered Legacy in IndonesiaJokowi’s Plans?